Lausanne, Switzerland, October 17th, 1986: Juan Antonio Samaranch opens an envelope and says in French: “the XXV Olympic Games will be hosted by the city of Barcelona in 1992”. Since that moment on, Barcelona has become one the most visited cities in Europe and it’s grown in population and facilities. 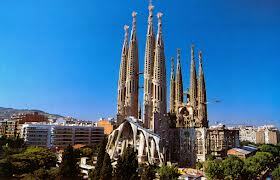 Who doesn’t know about La Sagrada Familia, Las Ramblas, el Castillo de Montjuic and much more? As you probably know, in Barcelona and the autonomous community of Cataluña, there are two official languages: Spanish and Catalan. But our students often ask us on Skype: how do they use Spanish there? They pronounce a final –t instead of –d: Madrid, Amistad, libertad (Madrit, amistat, libertat). In some parts of Cataluña they difference between b and v in the pronunciation. They use ves instead of ve, when they use the imperative form of the verb ir (to go). Ves a casa ahora mismo (go home right now). They use the articles el and la with the names of people: El Jordi está en el colegio (Jordi is at school). They change the impersonal form of the verb haber into a personal form: Habían tres coches en la calle (There were three cars in the street). The correct form should be: Había tres coches en la calle. We’re sure that you’ll enjoy your visit to Barcelona and if you need extra help for your stay there, you can book a lesson of our special course “Spanish survival” on www.spanishviaskype.com. We’ll show you how to order a pan tumaca, calçots or butifarra.